The difference between the groups is significant after adjustment for age (odds ratio [OR], 1.0; 95% CI, 0.9-1.1), premorbid activities of daily living (OR, 1.1; 95% CI, 1.0-1.1), premorbid independent activities of daily living (OR, 0.8; 95% CI, 0.7-1.0), premorbid mobility (OR, 1.0; 95% CI, 0.9-1.1), severity of symptoms (OR, 2.1; 95% CI, 1.4-3.2), length of stay (OR, 2.1; 95% CI, 1.4-3.2), depression symptoms (OR, 1.1; 95% CI, 1.0-1.3), and comorbidity (OR, 1.21; 95% CI, 0.99-1.48). 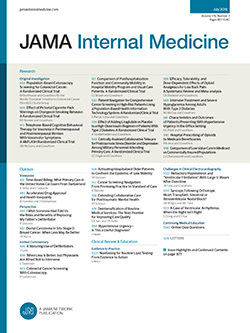 Mobility levels during hospitalization are a central modifiable factor in preventing in-hospital functional decline and postdischarge adverse outcome in older adults.1 It is acknowledged that “more is better” in the case of mobility; however, most patients spend most of their time in bed.2 Recently, 900 steps per day were identified as normative for frail, community-dwelling older adults3 and for older adults hospitalized in internal medicine units.4 Although these previous studies comprised large samples, they did not link the normative data with functional outcomes. Our study aimed to test whether the proposed normative value of 900 steps differentiates those who do from those who do not experience hospitalization-associated functional decline (HAFD). We conducted a prospective cohort study within an ongoing quasi-experimental study—Walk FOR (Functional Outcome and Recovery), a newly designed program that promotes in-hospital mobility. Study participants comprised 177 older patients who were hospitalized in 2 internal medicine units at an academic medical center in northern Israel between October 1, 2015, and December 31, 2015, before the implementation of Walk FOR. Patients 65 years or older, who were cognitively intact and able to ambulate with or without an assistive device 2 weeks before hospitalization, were evaluated at admission and discharge and wore an accelerometer on their ankle (Actical) for up to 3 consecutive hospitalization days. Mean total steps per day were calculated. The evaluation included cognitive, functional, and mobility assessments; current symptom severity; depressive symptoms; and demographics. The main study outcome showed a functional decline, defined as a 5-point or greater change in the modified Barthel Index score5—a self-rated level of independence in performing basic activities of daily living (ADL)—from premorbid function (ie, 2 weeks before hospitalization) to discharge. A 5-point decline is equivalent to full dependency in 1 of 10 ADL tasks. The study was approved by the ethical board of HaEmek Medical Center and the review board of the University of Haifa. All participants signed a written informed consent. The study revealed a vast diversity in steps walked per day (from 0 to 8111). Among 41.8% of participants who walked fewer than 900 steps per day, 55.4% (57 participants) reported HAFD, whereas among 58.2% of participants who walked 900 steps or more, only 18.4% (14 participants) experienced HAFD (odds ratio, 4.7; 95% CI, 2.0-11.0) (Figure). Premorbid function and mobility, depressive symptoms, and general symptom severity were also significantly related to change in functional outcome (Table). To evaluate the unique contribution of walking more than 900 steps per day to functional outcome, we calculated the C statistics for models with and without step count. Adding the 900-step threshold to the models, which included the parameters mentioned earlier, significantly increased the models’ discrimination power by 5% (from 0.8 to 0.84). During acute hospitalization, walking fewer than 900 steps per day (about a 500-m unit) is strongly associated with HAFD, after controlling for functional status and other major personal risk factors. To our knowledge, this is the first study to link number of daily steps with change in functional outcome in older adults hospitalized in internal medicine units. The importance of mobility has been well established, and previous studies have described numerous barriers to patient mobility,1 including the lack of additional resources, such as tailored interventions.6 Thus, dose-dependent recommendations of steps per day may enhance the efficiency of mobility practices. Limitations of this study include the recruitment of a relatively high-functioning sample of older adults from a single site. Nonetheless, this study adjusts for a broad range of intervening variables and relies on gold-standard, sensor-based data collection. Thus, it fills the gaps uncovered by previous studies and provides preliminary evidence to support the recommendation of 900 steps per day for HAFD prevention. These findings should be confirmed by future studies involving diverse groups of older adults. Corresponding Author: Maayan Agmon, PhD, The Cheryl Spencer Department of Nursing, Faculty of Social Welfare and Health Studies, University of Haifa, Bnei Brit 28, Haifa, Israel 34752 (agmon.mn@gmail.com). Author Contributions: Maayan Agmon and Anna Zisberg had full access to all the data in the study and take responsibility for the integrity of the data and the accuracy of the data analysis. Drs Agmon and Zisberg contributed equally to this study. Study concept and design: Agmon, Zisberg, Gil. Acquisition, analysis, or interpretation of data: Agmon, Zisberg, Rand, Gur-Yaish, Azriel. Drafting of the manuscript: Agmon, Zisberg. Administrative, technical, or material support: Agmon, Gil, Rand, Azriel. Study supervision: Agmon, Zisberg, Gil, Rand, Gur-Yaish.